Truth: Once upon a time I tried to read another popular book by this author and just did not like it. Here's more truth: I chose this as an Audible book because of the narrator. The woman that read this book aloud is magnificent. I also liked this book! This is the story of a family living in the Pacific Northwest in the 1970's. You have to keep reminding yourself of that because some of the events are a little incredulous in today's world. Cora and her husband, Erndt, are the parents of a young teenage girl, Leni. They move to Alaska one day when Erndt declares he wants a new beginning. He suffers from PTSD and is prone to violent outbursts, including hitting Cora. Cora and Leni have learned to tiptoe around and always play to his good side to keep the peace. Once they arrive in Alaska they survive only because of the kindness and generosity of the neighbors and townspeople that bring them supplies and teach them to prepare for the winter. In the middle of this, Leni meets Matthew at school and this turns her life upside down - as only a teenage romance can! Leni and Momma are quite a pair as they battle the harsh Alaskan country and Erndt's demanding and violent nature. This turns out to be a massive love story of a book, but it's about the relationship and love between Leni and Cora. I give it 5 stars as an audiobook because of the narrator. It's quite a believable book, but keep reminding yourself of the time period. In the 70's women did not report domestic abuse and PTSD was not a mental illness that was recognized like it is today. Overall, a great book! Speaking of love stories.... why don't we just try a beach read? Maybe, a beach read with predictable storylines and, hopefully, a happy ending! Enter Elin Hilderbrand! I have a small collection of books by this author. They are predictable. In fact, with this book, I knew what was going to happen on page 9. Elin's books are sweet and light and full of angst. But you love the characters. Elin's books have happy endings. But, isn't that exactly what we need sometimes? I started The Island after trying four books in a row that I did not like and did not finish. As soon as I made my predictions on page 9 with this book I could have stopped. At that point and that quickly I wanted to see it happen. I loved the girls, Chess and Tate and their mom, Birdie. Shortly after beginning you also meet Birdie's sister, India. It is these four women and the intricate relationships between them, plus their love interests that make this book fun and it's Elin's attention to detail that makes this more than a chick book! Some quick details: Chess is engaged to Michael, but he has a brother named Nick. Hmmm.. something interesting going on there but in a tragic way. Tate is a traveling entrepreneur with no boyfriend until the four women make it to a month-long vacation to Tuckernuck Island. Their caretaker is Barrett. Birdie is divorced from the girls' dad, Grant, and she is involved with Hank. Is she still friendly with Grant? And then there is India, whose husband has committed suicide. These four head to Tuckernuck for a month to get away from everything and resolve some of their major issues. That is all I can tell you without spoiling the book. I give this one 4.5 stars. You will love it! What a tangled story-line! This one works perfectly with this month's theme about relationships! The ways in which all these characters are bound together is incredible and complex. The setting for this one is the Falkland Islands. The main character is Catrin, a conservationist that works with the sea life on and surrounding the island. She is divorced from Ben and involved with Callum. Her two sons were killed when left alone in a car by her best friend, Rachel. Rachel has 3 children and she is in the midst of the same depression all of these characters have- grief and guilt about the death of Catrin's two boys. And, right in the middle of that, some small boys have also disappeared. All of the main characters are suspects in what is happening to the young boys and lies will fly left and right. You will love the characters and how they interact with each other or maintain a stony silence. Catrin's relationship with her conservationist job, the ocean, and the animals is also a big part of this story. That is about all I can describe without giving away the story completely! This was a page-turner for me! 4.5 stars! Here is something this book taught me: Our relationships are not always with people. Sometimes it's about animals or pets and, in the case of Liz Clark, it's about the ocean. As a very young girl, Liz went sailing with her family and was hooked on being a sailor. She dreamt of being able to own a large sailboat and just travel and surf. Then, miraculously, she connected with someone that would help her dream come true. He provided the sailboat and some financing and off she went. Her story is about her love of the ocean, island people, and wildlife. It all sounds rather magical, but in truth, it was HARD work. Liz spends quite a bit of time repairing problems on the sailboat, sometimes months at a time as she waits for parts on a tropical Pacific island. Often she has friends or relatives that will join her for a few weeks or months, but she also travels alone quite a bit. "I enjoyed mornings in the gallery after a surf, making fresh juices, jams, homemade granola, sprouts, yogurt, bread, or baked goodies. We'd often build a fire to cook over and watch the goat family descend from the hills to graze by the sea in the late afternoon. Grateful to stumble upon this heavenly paradise, I felt whole and peaceful and fortified by nature's blessings. And here is the ultimate relationship with reading and books. Sometimes, it is about the author! Many, many years ago I started reading Stephen King books. They are almost all fantastic, page-turning thrillers. Like sit-on-the-edge-of-your-seat and hold your breath. This one was certainly all of that (maybe with a little too much conversation). This is the story of a brutal kidnapping and killing of a young boy. There are witnesses that saw the suspect, his fingerprints are everywhere, and his DNA is found on the boy. And, yet, he claims to be innocent. And he has many ways to prove his innocence- including eyewitnesses and fingerprints found somewhere else. So, what is it for you? 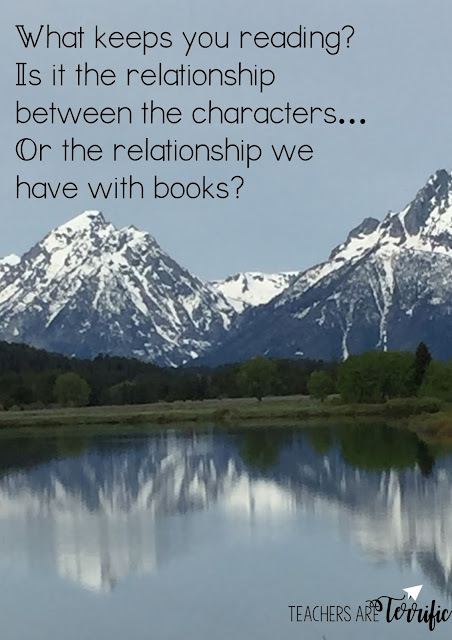 Why do you keep reading?